Being a huge My Little Pony myself as a child, I love that it is still just as popular now and I can share it with Gracie! 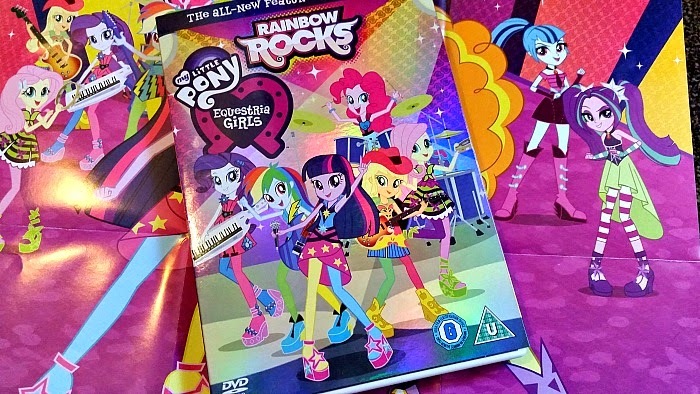 On the 23rd March the latest feature length movie 'My Little Pony Equestria Girls: Rainbow Rocks' was released and I have a copy to give away to one lucky reader! I also have a fantastic free activity sheet for you to print at home if you wish. Canterlot High is hosting a musical showcase and Rainbow Dash, Applejack, Pinkie Pie, Rarity and Fluttershy are going to be performing with their new band, The Rainbooms. But when a new girl group, The Dazzlings, arrives at CHS, they convince everyone to turn the friendly showcase into a Battle of the Bands. As tensions mount between the competing musical acts, a reformed Sunset Shimmer realises that the Dazzlings may not be ordinary girls and are after something far more sinister than just being named Best Band at Canterlot High. The Rainbooms call on Princess Twilight to return to their world to help them perform a musical counter-spell so that they can win a battle that now determines the fate of the entire school. Me and Gracie have actually watched the movie this week and it is great! It is the first time we have seen anything from Equestria girls but Gracie recognises which character is which by looking at their hair and colour. When I asked Gracie which parts of the film she liked she said she really likes the 'naughty girls' (The Dazzlings) and she loves all the music in the film. We really enjoyed watching it together and I feel we will now have to add some Equestria Girls to her fast growing collection of My Little Pony toys! You can download this image by right clicking and saving to your pc to print at home for your little ones to colour in. Open to UK only. The competition will end 17/04/2015 at 12am. All entrants must complete the mandatory entry on the rafflecopter form. Those who don't will have all entries removed. The blog owner will choose the winner through the rafflecopter form (which uses random.org) The winner will be notified by email and displayed on the widget. 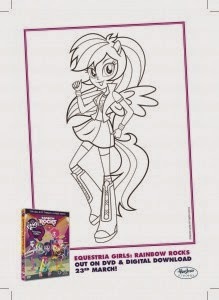 One winner will receive a My Little Pony Equestria Girls Rainbow Rocks DVD. No alternative prize will be offered. Allow up to 28 days for delivery. We watch disney movies together and have quite a collection. My girls love watching Art Attack, My Little Ponies, Porora the Little Penguin, Bugaboo and Dog and Duck - to name a few! It's all Disney in our house - I love "Good Luck Charlie"
Ellie loves watching Frozen and George Ezra videos! anything disney especially the little mermaid or frozen! the little mermaid. sweet home alabama, dirty dancing! Currently we enjoy watching Blaze, Wallykazaam and Planes 2. My daughter is obsessed with barbie and my little pony atm. She watches them on loop. Peppa Pig and Disney films are firm favourites with mine! As a family we love to watch Harry Potter. Thank you! I love watching Scooby Doo with my daughter she loves it just like i used to!